Donald Trump revealed his plan for squeezing OPEC in 2008 from CNBC. "Looks like OPEC is at it again. With record amounts of Oil all over the place, including the fully loaded ships at sea. Oil prices are artificially Very High! No good and will not be accepted!" "The biggest problem I never hear anybody talk about. I told you about it once. Every time they lower interest rates, the cartel, because I call it a cartel-- the illegal monopoly-- raises oil prices. So the monopoly, because that's what it is, a total illegal monopoly. If businesses ever formed OPEC, everybody would be put in jail. Every time a country hits oil, they are invited into the cartel. It's a disgrace. Now you have oil prices that are going to be over $100, and nobody in this country calls and says. 'Get that goddamn oil price down. You get it down. And you get it down fast. '""And you can do it….In the old days, our presidents used to call. We don't call anymore….If spoken to properly, those prices would come down like you wouldn't believe." According to a news report, OPEC's Secretary-General Mohammad Barkindo said that OPEC began a discussion about easing production cuts following that tweet from Trump. But the White House had reportedly secured agreement by the Saudis and others to increase production to offset any reduction in exports from Iran as a result of the new U.S. sanctions. "we are not interested in an endless growth of energy prices, of oil prices. If you asked me what price do we think is fair, then I'm telling you fair-not fair, but we were content with the price of $ 60 per barrel." "certain problems for consumers, what the main producers are also not interested in… we understand that the opportunities of our competitors, including shale oil producers in the US, are growing, they fill a certain part of the market." With Brent trading at $76/b on May 25th, that implies a price drop of $16/b if Putin gets his way. That would also bring WTI futures prices down to about $55/b. The Saudis want a close relationship with the U.S., and the cooperation with Russia has also been critical to this deal. Therefore, Saudi Arabia's oil minister, Khalid al-Falih, and Russia's oil minister, Alexander Novak, reportedly agreed on an increase in the targeted output of up to 1 million barrels per day. The OPEC ministers are also worried about U.S. anti-trust laws. In a press release dated May 24th, the House Judiciary Committee Chairman Bob Goodlatte (R-Va.) joined a bipartisan group of lawmakers in introducing the No Oil Producing and Exporting Cartels Act (H.R. 5904). "This legislation would make the Organization of the Petroleum Exporting Countries (OPEC) subject to antitrust law by removing a state immunity shield created by judicial precedent," according to the press release. "The purpose of antitrust law is to protect consumers from behemoths in any industry that threaten competition and control prices. The fact that OPEC has not been held accountable for its cartel behavior makes a mockery of U.S. antitrust law, threatens the American economy, and has the potential to harm our national security." Under this bill, OPEC and other producers could be held responsible for collusion, which raises gas prices and hurts the development of energy alternatives. "As the Supreme Court has explained, "under the Sherman Act, a combination formed for the purpose and with the effect of . . . stabilizing the price of a commodity in interstate or foreign commerce is illegal per se." OPEC's organizational document, under the heading "objectives," states that the "organization shall devise ways and means of ensuring the stabilization of prices in international oil markets." "Despite strong support in Congress over a period of years, NOPEC has not yet become law. However, recently, President Trump signaled that he may be more receptive than prior presidents to NOPEC. This creates a real opportunity to enact this long overdue law." The Saudis have to perform a juggling act to keep both the U.S. and Russian governments happy, while they try to maximize their own oil revenues. With both the U.S. and Russia saying oil prices are too high, it had to succumb to the pressure to increase output, though it needs oil prices in the $80s to balance its own national budget. The verdict is in: $80 crude is too high. 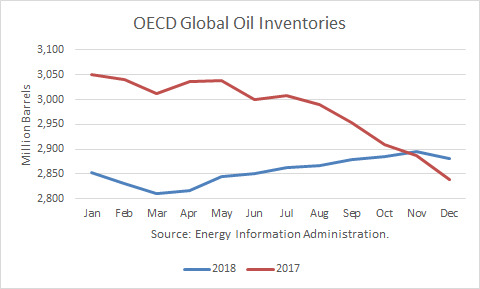 According to the DOE's forecast, if OPEC maintains current production to make up for lost Venezuelan barrels, and offsets any Iranian barrels lost, global oil inventories will actually rise modestly this year. Under that scenario, WTI futures would return to the $55/b range. If the NOPEC legislation is passed, the production deal will likely fall completely apart, and OPEC will finally be dead in so far as production deals.